Psychoactive drugs work by manipulating the synapses in between nerves in the central nervous system. Most of the psychoactive substances, with the exception of alcohol, work by containing chemicals that are very similar to the neurotransmitters that cross this synapse (Sullivan and Hagen, 2002) . This is Serotonin. Serotonin is a common neurotransmitter found in many nerve synapses. It is responsible for regulating some moods in the brain ("serotonin"). This is psilocybin. 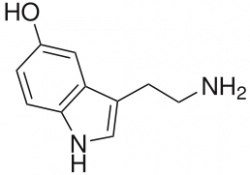 Psilocybin is a type of hallucinogen that is found in certain mushrooms ("psilocin and psilocybin"). You can see the structural similarities between the Serotonin molecule and the Psilocybin molecule. It is easy to imagine that a chemical receptor could intrepret Psilocybin as Serotonin. 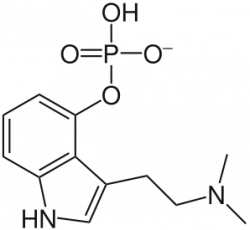 Psychoactive chemicals such as Psilocybin bind to the receptors on the on the post-synaptic cell and propagate an action potential just as their native counterparts would. In other words, they cause the nerves to fire even if there is not a incoming transmission from the pre-synaptic cell. In the video below, neurotransmitters are the yellow spheres that emerge from the pre-synaptic cell and travel to the receptors below. The imitation of these transmitters and the firing of neurons make the brain act out of control. The result of these firings are both physical and mental effects that vary depending on the drug. Opiates result in a feeling of euphoria. Users feel little pain and generally have an improved mood and a loss of fear. Hallucinogens, as their name suggests, result in visions and hallucinations where light, colors, and sounds are enhanced and more vivid. Personal space, identity and awareness are altered and accompany a detatchment from reality. These effects can last from a few minutes to 12 hours. It is especially easy to see why they are used in religious settings. Cannabis use results in feelings of euphoria, perceptual distortions, thought process disruptions and loss of reality ("drug use"). The appeal these substances has is obvious, regardless of the negative effects that accompany these feelings. What is interesting is that these chemicals are designed by natural selection to disrupt the emotions and prevent the animal who consumed the plant from trying again. Instead, chemicals of certain psychoactive plants seem to have a positive effect and result in either a increase in positive emotions or a decrease of negative emotions (Nesse and Berridge, 1997). This is interesting as it indicates a possible evolution to use these substances. "drug use." Encyclopædia Britannica. 2010. Encyclopædia Britannica Online. 10 Apr. 2010 <http://www.britannica.com/EBchecked/topic/172024/drug-use>. Nesse Randolph M., Berridge Kent C. “Psychoactive Drug Use in Evolutionary Perspective.” Science 278 (1997): 63-66. Print. "psilocin and psilocybin." Encyclopædia Britannica. 2010. Encyclopædia Britannica Online. 18 Apr. 2010 <http://www.britannica.com/EBchecked/topic/481419/psilocin>. "serotonin." Encyclopædia Britannica. 2010. Encyclopædia Britannica Online. 18 Apr. 2010 <http://www.britannica.com/EBchecked/topic/535741/serotonin>. Sullivan R. J., Hagen E.H. “Psychotropic substance-seeking: evolutionary pathology or adaptation?” Addiction 97 (2002): 389-400. Print.